Happy new year! Instead of vacationing, I spent the last few days helping a client switch over to a new ISP and the ISP hosted mail server. Unfortunately, they still refuse to switch over to Google Apps, so they have to deal with the ISP's poor mail service. 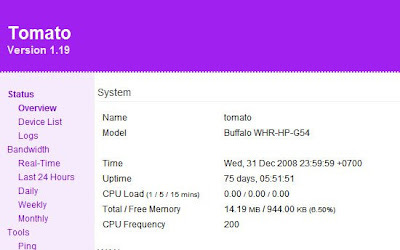 Plus they're still using my Buffalo wireless router running Tomato, now with a slightly amazing 75 day of uptime. The last reboot happened when I updated the firmware. I even switched to the new ISP without having to reboot the router. After the new year, I'm gonna take it back so I can finally get to play with it myself. I bought the Buffalo back in June and it's been at the client site since July. The Buffalo router is no longer available locally for some unknown reason, and the shop that I bought it from denies that they've ever carried it. (In fact, they've only ever had one piece, and I bought it.) So I really really want to try it out. Have you tried Victek's Tomato mod? It adds more features and leaves you with more free ram. Try it out. I have 8mb free ram after a reboot compared to 4mb free ram.